Disappointing, that's how I'd describe the series finale of the once acclaimed TV Show, House of Cards and that would be me stating it mildly. While it seemed that the show has being going downhill after the second season but this one takes the cake. Granted the sixth season had to be rewritten after Kevin Spacey was fired from the show but the execution was the finest display of shithousery. This seaosn seemed like it lacked a central plot like the previous five seasons did. And for something that had fewer episodes than the previous the plot was really thin. From the episode 5 where Claire went all cry baby on it was really clear that the writers had nothing and were just dragging things as much as they can. 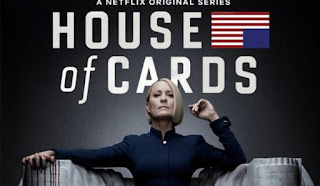 The whole shebang ends with Claire killing Doug in the Oval Office and just like that the House of Cards that Frank built came crashing not with a loud bang but with a whimper.